Having left Ingrow on the 28th August last year for external and partial internal restoration and overhaul at Rail Restorations North East Ltd. in Shildon, the Bahamas Locomotive Society’s Breakdown & Tolls Van has now returned to its Ingrow base. This ex-LMS corridor composite passenger coach is the centre of the new educational resource planned as part of the £3/4M Heritage Lottery Fund funded project to overhaul Jubilee Class, Bahamas. The coach was converted in 1958 for use in breakdown trains, with one area of the coach used for the storage of tools and equipment while three of the original compartments were retained for use by the railway staff, one of which was converted into a kitchen. At Ingrow it will be internally repaired and converted for its new use. 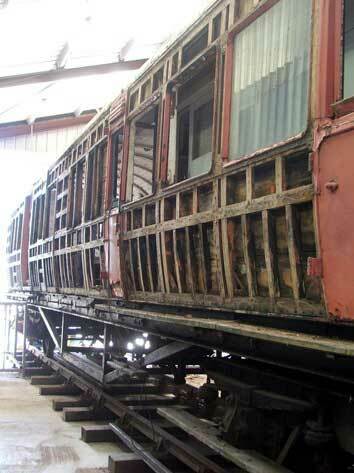 This will entail restoration of one of the compartments to its original passenger-carrying splendour, while the former tool and equipment stowage area will be used as an exhibition space and classroom facility. The internal work is to be undertaken by Society volunteers planned so that the Learning Coach will be operational at the commencement of the school term this September. For further information on this coach visit the Bahamas Locomotive Society’s own dedicated website.